Granuloma faciale (GF) is an uncommon benign chronic skin disease of unknown origin characterized by single or multiple cutaneous nodules, usually occurring over the face. See the images below. Solitary, well-demarcated, brown-red plaque associated with granuloma faciale. Multiple brown-red plaques on the face associated with granuloma faciale (same patient as in Media Files 13-16). Occasionally, extrafacial involvement is noted, [1, 2, 3, 4] most often on sun-exposed areas. Lever and Leeper first recognized granuloma faciale as a distinct entity in 1950. Pinkus' group suggested the name granuloma faciale that same year. 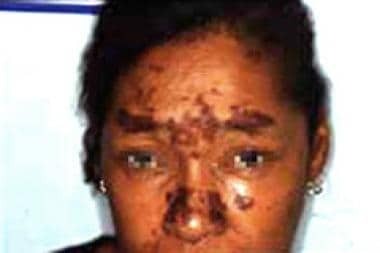 The disease mimics many other dermatoses and can be confused with conditions, such as sarcoidosis, discoid lupus erythematosus, mycosis fungoides, and fixed drug eruption. See Sarcoidosis, Discoid Lupus Erythematosus, Mycosis Fungoides, and Fixed Drug Eruptions for more information on these topics. Sun exposure may play a role. Sunlight-exposed areas are more commonly affected than non–sun-exposed areas. Lesions may darken with sunlight exposure. Cases of granuloma faciale are rare. Granuloma faciale is found most commonly in whites; however, it has been reported rarely in Japanese and blacks. Men are affected more frequently than women. Granuloma faciale is primarily a disease of middle age (median age, 45 y). No systemic involvement has been reported with granuloma faciale. The disease is benign except for its appearance. Granuloma faciale may persist indefinitely if untreated; spontaneous resolution rarely occurs. Granuloma faciale has a tendency to relapse after treatment. Inform the patient about scarring and the recurrence of the condition if an ablative procedure is performed. Inform the patient about the adverse effects of medications and the need for follow-up care while taking these medications for this recalcitrant disorder. Konohana A. Extrafacial granuloma faciale. J Dermatol. 1994 Sep. 21(9):680-2. [Medline]. Roustan G, Sánchez Yus E, Salas C, Simón A. Granuloma faciale with extrafacial lesions. Dermatology. 1999. 198(1):79-82. [Medline]. Sears JK, Gitter DG, Stone MS. Extrafacial granuloma faciale. Arch Dermatol. 1991 May. 127(5):742-3. [Medline]. Sewell L, Elston D. Extrafacial granuloma faciale successfully treated with 595-nm pulse dye laser. J Amer Acad Dermatol. 2008 Feb. 58(2):AB141. Burns BV, Roberts PF, De Carpentier J, Zarod AP. Eosinophilic angiocentric fibrosis affecting the nasal cavity. A mucosal variant of the skin lesion granuloma faciale. J Laryngol Otol. 2001 Mar. 115(3):223-6. [Medline]. Vassallo C, Derlino F, Croci GA, Brazzelli V, Borroni G. Chronic localized leukocytoclastic vasculitis: clinicopathological spectrum of granuloma faciale with and without extrafacial and mucosal involvement. G Ital Dermatol Venereol. 2015 Feb. 150 (1):87-94. [Medline]. Stelini RF, Moysés MD, Cintra ML, Soares TC, Souza EM, Altemani AM, et al. Granuloma Faciale and Eosinophilic Angiocentric Fibrosis: Similar Entities in Different Anatomic Sites. Appl Immunohistochem Mol Morphol. 2016 Jan 22. [Medline]. Gauger A, Ronet C, Schnopp C, Abeck D, Hein R, Köhn FM. High local interleukin 5 production in granuloma faciale (eosinophilicum): role of clonally expanded skin-specific CD4+ cells. Br J Dermatol. 2005 Aug. 153(2):454-7. [Medline]. Smoller BR, Bortz J. Immunophenotypic analysis suggests that granuloma faciale is a gamma-interferon-mediated process. J Cutan Pathol. 1993 Oct. 20(5):442-6. [Medline]. Leite I, Moreira A, Guedes R, Furtado A, Ferreira EO, Baptista A. Granuloma faciale of the scalp. Dermatol Online J. 2011 Apr 15. 17(4):6. [Medline]. Nasiri S, Rahimi H, Farnaghi A, Asadi-Kani Z. Granuloma faciale with disseminated extra facial lesions. Dermatol Online J. 2010 Jun 15. 16(6):5. [Medline]. Atallah J, Garces JC, Loayza E, Carlson JA. Chronic Localized Fibrosing Leukocytoclastic Vasculitis Associated With Lymphedema, Intralymphatic and Intravascular Lymphocytosis, and Chronic Myelogenous Leukemia: A Case Report of Unilateral Erythema Elevatum Diutinum. Am J Dermatopathol. 2017 Jun. 39 (6):479-484. [Medline]. Oliveira CC, Ianhez PE, Marques SA, Marques ME. Granuloma faciale: clinical, morphological and immunohistochemical aspects in a series of 10 patients. An Bras Dermatol. 2016 Nov-Dec. 91 (6):803-807. [Medline]. Kavand S, Lehman JS, Gibson LE. Granuloma Faciale and Erythema Elevatum Diutinum in Relation to Immunoglobulin G4-Related Disease: An Appraisal of 32 Cases. Am J Clin Pathol. 2016 Mar. 145 (3):401-6. [Medline]. Bergfeld WF, Scholes HT, Roenigk HH Jr. Granuloma faciale--treatment by dermabrasion. Report of a case. Cleve Clin Q. 1970 Oct. 37(4):215-8. [Medline]. Apfelberg DB, Druker D, Maser MR, Lash H, Spence B Jr, Deneau D. Granuloma faciale. Treatment with the argon laser. Arch Dermatol. 1983 Jul. 119(7):573-6. [Medline]. Wheeland RG, Ashley JR, Smith DA, Ellis DL, Wheeland DN. Carbon dioxide laser treatment of granuloma faciale. J Dermatol Surg Oncol. 1984 Sep. 10(9):730-3. [Medline]. Dowlati B, Firooz A, Dowlati Y. Granuloma faciale: successful treatment of nine cases with a combination of cryotherapy and intralesional corticosteroid injection. Int J Dermatol. 1997 Jul. 36(7):548-51. [Medline]. Maillard H, Grognard C, Toledano C, Jan V, Machet L, Vaillant L. [Granuloma faciale: efficacy of cryosurgery in 2 cases]. Ann Dermatol Venereol. 2000 Jan. 127(1):77-9. [Medline]. Zacarian SA. Cryosurgery effective for granuloma faciale. J Dermatol Surg Oncol. 1985 Jan. 11(1):11-3. [Medline]. Ammirati CT, Hruza GJ. Treatment of granuloma faciale with the 585-nm pulsed dye laser. Arch Dermatol. 1999 Aug. 135(8):903-5. [Medline]. Lindhaus C, Elsner P. Granuloma Faciale Treatment: A Systematic Review. Acta Derm Venereol. 2018 Jan 12. 98 (1):14-18. [Medline]. Elston DM. Treatment of granuloma faciale with the pulsed dye laser. Cutis. 2000 Feb. 65(2):97-8. [Medline]. Welsh JH, Schroeder TL, Levy ML. Granuloma faciale in a child successfully treated with the pulsed dye laser. J Am Acad Dermatol. 1999 Aug. 41(2 Pt 2):351-3. [Medline]. Norris DL, Apikian M, Goodman GJ. Treatment of Laser Resistant Granuloma Faciale with Intralesional Triamcinolone acetonide and 5-Fluorouracil Combination Therapy. J Cutan Aesthet Surg. 2015 Apr-Jun. 8 (2):111-3. [Medline]. Hudson LD. Granuloma faciale: treatment with topical psoralen and UVA. J Am Acad Dermatol. 1983 Apr. 8(4):559. [Medline]. Marcoval J, Moreno A, Bordas X, Peyrí J. Granuloma faciale: treatment with topical tacrolimus. J Am Acad Dermatol. 2006 Nov. 55(5 Suppl):S110-1. [Medline]. Gupta L, Naik H, Kumar NM, Kar HK. Granuloma faciale with extrafacial involvement and response to tacrolimus. J Cutan Aesthet Surg. 2012 Apr. 5(2):150-2. [Medline]. [Full Text]. Tojo G, Fujimura T, Kambayashi Y, Kikuchi K, Aiba S. Successful treatment of granuloma faciale with topical tacrolimus: a case report and immunohistochemical study. Case Rep Dermatol. 2012 May. 4(2):158-62. [Medline]. [Full Text]. Dourmishev L, Ouzounova-Raykova V, Broshtilova V, Miteva L. Granuloma faciale effectively treated with topical pimecrolimus. Acta Dermatovenerol Croat. 2014. 22 (4):305-7. [Medline]. Goldner R, Sina B. Granuloma faciale: the role of dapsone and prior irradiation on the cause of the disease. Cutis. 1984 May. 33(5):478-9, 482. [Medline]. Guill MA, Aton JK. Facial granuloma responsive to dapsone therapy. Arch Dermatol. 1982 May. 118(5):332-5. [Medline]. van de Kerkhof PC. On the efficacy of dapsone in granuloma faciale. Acta Derm Venereol. 1994 Jan. 74(1):61-2. [Medline]. Histologic findings in granuloma faciale. Histologic findings in granuloma faciale include a normal epidermis; a grenz zone of uninvolved dermis just beneath the epidermis; and a dense, polymorphous inflammatory infiltrate located in the papillary and mid dermis. The infiltrate consists of neutrophils, lymphocytes, eosinophils, monocytes, and, occasionally, mast cells. Perivascular inflammation is also observed. 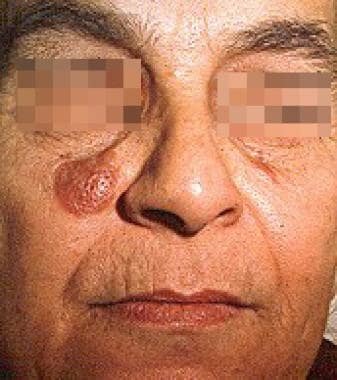 Multiple brown-red plaques on the nose associated with granuloma faciale (same patient as in Media Files 12 and 14-16). Multiple brown-red plaques on the forehead associated with granuloma faciale (same patient as in Media Files 12-13 and 15-16). Close-up view of multiple brown-red plaques on the forehead associated with granuloma faciale (same patient as in Media Files 12-14 and 16). Close-up view of multiple brown-red plaques on the nose associated with granuloma faciale (same patient as in Media Files 12-15).